During the last couple of weeks, gaining perspective on the two health care reform acts working their way through Congress has been a priority over commentary. Observing whether or not the public option is being so weakened as to make it ineffective has been a constant concern. Watching the developing and predicted force feeding of abortion issue politics as a poison pill within the debate has been disquieting…more doses unfortunately will be forthcoming. On balance, not everything in these bills is as progressive as one might desire but with liberal Representatives and Senators we can trust staying with the process and compromises, it continues to be reasonable to be supportive of both bills prior to conference committee work at some time in the future. Perfect is always the enemy of the imperfect. If the outcome is a marked step forward toward regulating insurance company discriminatory practices, will increase access to quality and affordable care, and develops a public option, we will have a framework on which to build, modify, and expand further substantive health care reforms in the near future. One perspective to view health care reform from is the historical development of Social Security. The original legislation in 1935 had many coverage gaps and was a far weaker program than it is today. Significant amendments to the act in 1939 and 1950 (when it became much more universal) along with the constant attention to improving the program’s effectiveness to the present day are a result of expanding on Franklin Roosevelt’s vision. Republicans do also recognize that health reform today will open the door to additional reforms tomorrow. It is no wonder that right-wing efforts to engage in revisionist history and to vilify FDR and the New Deal are at a fever pitch on scream radio and conservative blabsites. In Maine, once again our efforts must be focused on preventing our Senators from derailing or damaging the initial legislation. In a story by Matt Wickenheiser, Maine Today Media has decided to become a part of the the legendary Snowe-making machinery equating her serious style with wisdom. Giving Senator Snowe occasional good marks for diligence and even level-headiness may be appropriate. However, just being earnest does necessarily yield wise statecraft. Senator Snowe is fallible, subject to misdirection, can be close-minded, and simply be dead wrong. That's the case with health care reform, Snowe has a nice bedside manner but her diagnosis is inaccurate and her prescription is full of complications for the patient. Sen. Olympia Snowe reiterated one of her key positions Friday, saying she won't support a Senate bill that contains a public option. The most vital tool to control costs effectively to cover the most individuals, supported by a majority of both houses of Congress, the President, the American people, and constituents in Maine continues to earn a complete dismissal. She again suggested her alternative to a full government-backed plan: a fallback, safety-net plan that would be triggered in states where insurance companies fail to offer affordable plans. Senator Snowe continues to tout her plan for a triggered public option fashioned for failure despite compromise after compromise and concession after concession that have brought us to the present "opt-out" public option version. "I just think it's going to be very difficult to get it done by Christmas," she said. A procrastinator's persistent petulance prevails. "Introducing a government approach in an already dysfunctional market would truly threaten the ability to create a competitive market," Snowe said. Oozing gravitas apparently can obliterate a lack of logic in any utterance. Faith-based market worship blinds her. Snowe said that what has happened in the insurance industry has been "unconscionable." Those are fighting words! Run up the white flag! Let's put Senator Snowe's dalliance with health care reform in some sort of perspective. She has diagnosed a dysfunctional market. The dysfunction comes about from an insurance industry engaged in activity that is "unconscionable". Majorities of her colleagues, Americans, and Maine constituents see the value of a public option as the corrective solution. And, she seems to agree that a public option can fix things too. Senator Snowe has thus concluded that threatening an industry engaged in "unconscionable" practices in a dysfunctional market they brought about ought to be threatened with the fix for a few years. Maybe they will the play nice. Senator Snowe: We're weary of your delaying tactics and continual preference for corporate entities over critical individual needs; please get with the program or at the very least stop obstructing the process by seeking concessions that hurt us. October 28, 2009 - ALEXANDRIA, VA – The 60 Plus Association today announced a new advertising campaign targeting Senator Snowe. The $2.0 million ad buy, which will also run in Alaska, Arkansas, Connecticut, Louisiana, Nebraska, North Dakota, and South Dakota, celebrates our greatest generation, asks seniors to call Senator Snowe and demand she fight the massive cuts to Medicare the current health care reform legislation before the Senate would bring. Here is the actual Maine version of the ad found on You Tube. It is easy to identify the fear tactics used by 60 Plus. 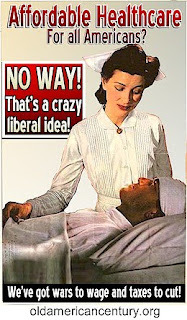 However, the organization actually has the callous audacity to accuse health care reformers of being the fear mongers! “Even with Halloween around the corner, Senator Snowe shouldn’t be scaring seniors with the threat of Washington bureaucrats refusing care or making health care decisions instead of your doctor,” said Jim Martin, President of 60 Plus. There is one simple thing we can all do when these ads start running amok across our screens here in Maine. Adopt a senior. And if you are senior, adopt a peer. Find an senior neighbor or relative and ask them if they saw the ad and if it caused any concern. Tell them that health care reform is about improving health care for all Americans and not to the detriment of anyone else. Listen and share your views in a caring manner. Better health care for them, their children and grandchildren is the fulfillment of their sacrifice. And be sure to thank them for bequeathing to us a country where universal health care is possible. Here are two timeless quotes to heed today that inspired the greatest generation. "This is preeminently the time to speak the truth, the whole truth, frankly and boldly. Nor need we shrink from honestly facing conditions in our country today. This great Nation will endure as it has endured, will revive and will prosper. So, first of all, let me assert my firm belief that the only thing we have to fear is fear itself—nameless, unreasoning, unjustified terror which paralyzes needed efforts to convert retreat into advance." "...the right to adequate medical care and the opportunity to achieve and enjoy good health." Pass health care now. We are fearless. A public option will now get debated in the Senate. The opt-out option announced today by Senate Majority Leader Reid is far superior to the trigger in many ways. Consistent broad voter support of a public option and your activist efforts kept this fight for fairness alive. The health care lobby came extremely close to killing the public option in the Senate. It is imperative to remind ourselves that they will not surrender. They will try to influence the processes at every single step. And rest assured that they and their surrogates will also resort again to fear tactics. We need to ensure that the Senate Democratic caucus stands together and that no single member abandons the aspirations and essential needs of the citizens who gave the Democratic party a mandate by slinking off and joining the Republicans in a filibuster even if they might be individually disinclined to support the final bill. We must intensify pressure on both Senators Snowe and Collins to support substantive health care reform with a robust public option. It is also critical that we be wary of too much attention being given to our Senators when it might cross the threshold into too much concession. We expect them to support our interests and not be granted the capability to barter away our hopes. Every great once in a while, pulling a loaded gun’s trigger accidently causes a misfire injury or death. That’s accidently; one could of course deviously rig things for an intentional result. However, this column is not about hashing out 2nd amendment arguments but trying to dissect Senator Snowe’s politicking. Perhaps this is Senator Snowe’s objective all along. The TNR piece has enough good information in it to help anyone compose a very good letter to Harry Reid and Christopher Dodd about not including a trigger in a combined Senate bill. Whoops, left out Max Baucus…must be an oversight, sorry misplaced his contact information. “For months now, political analysts throughout the country have been attempting to divine Senator Olympia Snowe’s intentions towards health care reform. Now, it’s come down to reading her body language. With a single sentence to reporters and a nod of her head as she walked down a Senate corridor, Snowe today appeared to say she would filibuster a health care bill if it contains a public option. If that interpretation is correct, Senator Snowe would be signaling her intention to deny the people of Maine the affordable health coverage they desperately need. Three recent polls have all shown around 58% of Mainers in support of a public health insurance option, with only 35% opposed. A recent Democracy Corps poll showed that a vote against real health care reform would reduce her electoral support to 44%, with another 44% of Mainers surveyed opposing her reelection. Premiums have risen astronomically for Maine people over the past decade and Anthem, Maine’s largest insurer, is now engaged in a legal battle with the state to raise them even higher. They have proposed an unconscionable 18.5% increase for individual plans. $263,000,000 has been spent by health care lobbyists this year. The average individual annual health insurance premium is $4,824. $263,000,000 divided by $4,824 is enough to cover 54,500 people. 45,000 people a year die in the US due to lack of health insurance. Yes, the deaths are only a portion of the uninsured but all the plans on the table are aimed to reduce the uninsured by payment of premiums! Get more background on the numbers story at Dirigo Blue. Maybe the health care industry, big pharma, and health insurance lobbyists could just save the cash for quarterly dividends and simply mail death certificates directly to Congress. In Maine we’ve seen the courting of Senator Olympia Snowe to obtain a bipartisan imprimatur on the Finance Committee mark yielding the negative result of a weakened bill devoid of a strong public option. Will the pursuit of bipartisanship now extend to the full Senate in an equally damaging manner? We will soon find out as the Finance and HELP Committee efforts get combined and move in front of the full Senate. One obstacle that the press often points out as a supporting reason to pursue “bipartisan” course is the looming threat of a Republican filibuster. However, there is absolutely no such thing, it is a deceptive illusion. A Republican filibuster is technically not feasible within the full Senate because the body is divided in such a way (60/40) that with a full roster it takes 41 votes to frustrate the advance of vital legislation. That’s 41 Republican votes, not 40; there are 40 Republican Senators. Lather, rinse, repeat…that’s 41 Republican votes, not 40; there are 40 Republican Senators. The concluding vote math is easy; a filibuster in the current United States Senate must be bipartisan. At the very minimum a single member of the Democratic caucus must jump ship and support the use of a filibuster against her/his own fellow caucus. In this case it is not a trivial hop across the aisle from a divided caucus but a leap across a chasm containing a majority of the Senate supporting a public option. The pursuit for a lone Republican to get a bipartisan stamp on a bill reported out of committee at 14 - 9 when 13 -10 or even 12 -11 might have advanced better legislation was pointless. This isn’t supposed to be some sort of reality TV show called the “Amazing Chase” to get a single Republican vote for health care reform. Citizens cannot be fooled this easily; bona fide bipartisanship obviously involves the contributions of larger groups when it can be achieved. We also understand that it is not possible this time because Republican Senators in any real numbers do not genuinely support meaningful health care reform in any way, shape, or form. Besides, they have their own reality TV show, “Extreme Fakeover”, in which a lone filibustering Democrat is lured into the Republican pack ready for reruns. Any forthcoming filibuster threat will be as bipartisan as Olympia Snowe’s committee vote. Is Senator Snowe a planted Republican mole or joining with the Democrats to play an outsized role that destroys health care reform efforts from within? No. This column isn’t a left wing version of “Beck conspiracy in everything” nuttiness. However, Olympia Snowe is playing an outsized role in health care reform legislation that is weakening substantive reform and killing chances of an immediately available robust public option. We need to help stop this unwitting mole activity. Maine citizens can and should continue to be on the offense and contact Senator Snowe to demand that she support significant health care reform represents our needs for urgent and substantive action. We also need to be defensive and let other Democrats know that Maine citizens are not aligned with Senator Snowe’s destructive gutting of reform and feel poorly represented as a result. We need their understanding that beyond state borders we recognize a need for national program that is far stronger than what Senator Snowe is willing to barter away in the name of negligible bipartisanship. "My vote today is my vote today. It doesn't forecast what my vote will be tomorrow." Our senior Senator has garnered a lot of national press with expectations of her vote for the Baucus bill and her eventual Finance Committee vote in favor of the measure. Take little comfort from her involvement, it has not served us well. In part to earn her vote, the public option that would save us the greatest amount of money and save us from insurance company exploitation never appeared in the bill. Certainly there are a few Democratic members aligned against the public option but her acceptance of it could have been pivotal. Instead Senator Snowe influenced the watering down of the Finance committee bill. Her support may indeed prove to be a thorn that penetrates deeper. Now there will be a concerted effort to keep her on board with the hopes of also attracting her colleague and our other wayward Senator, Susan Collins. This effort could indeed ensure that the Senate’s eventual merged bill of the Finance and HELP measures has no public option or just a public option gimmick like a trigger. Senator Snowe will have future water runs available to her to dilute the reform desperately needed and assist keeping insurance companies floating on top. The final step will be the House/Senate Conference to craft the final bill. It will pit a weakened Senate bill against the more robust public option offerings that the House is sure to pass. Senator Snowe may even have a seat in that conference but if not will surely have an open back door. After she helped weaken the Senate Finance Committee bill and likely assisted in passing a weak Senate combined bill tailored to keep her “bipartisan” stamp on things, do we want her doing further damage to health care reform? The national press will continue with their attention on our senior Senator. The lobbyists and influence peddlers will remain in touch with her with their privileged special Washington access to keep their version of market solutions in front of her. Some leading Democrats, despite the fact that she will weaken the very reforms they know in their hearts are essential and even the administration seeking the bipartisan imprimatur will continue to court her vote and thereby give her a role out of proportion to what would best serve us in Maine. In Maine, citizens really need substantive robust reform. We need a public option and not some flimsy state sized substitute public option but a national solution that is powerful enough to save us substantial money in a nationally reformed system. The argument will arise that some reform is better than none. But like a badly broken bone, set improperly, the future difficult complications sure to come will be on the nation’s and Maine’s horizon. Constituents are one voice in the process, one that all the other powerful influences are dismissing and trying to suppress. We must counter loudly and forcibly hold Senator Snowe accountable to us. She may not “forecast what my vote will be tomorrow” but we need to forecast the storm that results from giving into the pressure system in Washington with its effect on the political weather in Maine. We must translate Senator Snowe's “you lose me” if a public option gets in the final bill to “you lose us” if she does not support substantive reform. Watching MSNBC's Dylan Ratigan, who started his journalism career at the Portsmouth Herald next door, can be an exhausting tour de force. Whatever one deduces about his opinions, his logic is sharp and his questioning is doggedly pointed. At the heart of his economy reporting is a provocative message about manipulation of the many by the few feeding excessive greed and for unearned rewards with long term consequences. His explanation of corporate communism in this piece is particularly apt and his fair warning that our form of capitalism could capitulate into the type of thugocracy we see today in “democratic” Russia is prescient. Here he is referencing corporate communism in a highly spirited health care debate with anti-health care reform shrill Betsy McCaughey and Congressman Anthony Weiner. Reading the Wall Street Journal can be a difficult chore at times when wading through market and business news about how corporations and industries manipulate everything from Washington to currencies to their own opaque images. Wearily one comes to the editorials and opinions that cheerlead and critique aspects of a superficial world that real people who are the instruments and hostages of capital do not inhabit. But there is much that is to be gleaned from careful reading of this chronicle of corporate elitism. A wry smile at quirky front page offbeat stories, an impressive answer back to the palaces of power in an op-ed or letter, and perhaps a useful personal finance pointer are occasional rewards. And an understanding of the financial class's evangelical manipulation of tax and free market religion to single-issue conservative voters to insulate them from regulation and continue feeding the politics of selfishness is valuable. Then comes Wednesday and The Tilting Yard by Thomas Frank that tells me that a genuine op-ed which in one of its best roles as “opposition-editorial” does take place within the pages of the Wall Street Journal. This week’s installment, like many, gets behind the gauzy curtains of Republican Conservatives exposes their shallow interpretation of economic theory and adoption of sound bite politics. Mr. Frank challenges the right wing’s mantra of government as predator by once again demonstrating that corporate teeth in the state’s jaw are the real danger to health care reform. George Smith's Kennebec Journal column, the Native Conservative, today included praise for the Italian socialized health care system. He gave a quaint tale, never mentioning socialism, taxes, or big bad government about his brush with the system and implying how well it worked. I often refer to him as the "Naive Conservative" precisely because he so often "can't see the forest because of the trees" despite all his time in the woods! Read his piece, which is the first half of the column, and preview the letter of response below submitted for Journal publication that will appear hopefully soon. George Smith’s October 7th quaint vignette of Italian health care does not take the tale to its logical conclusion. Italy has a public plan modeled along the lines of the British system. The World Health Organization system ranks Italy #2 out of 191 countries for quality care outcomes. The US is ranked #37. In 2005, Italy spent 8.9% of GDP or $2,714 per person on health care; the US spent $6,347 per person on health care or 15.2% of GDP. Italians live longer, have lower birth mortality rates, and more doctors per capita. Everyone is covered in Italy and guests such as the Smiths are treated efficiently and fairly when the need arises. Yes, Italy taxes to fund their system but the net costs as noted above are far less to every individual. Conservative voices ought to be supporting a robust public plan because it is a conservative wise investment in citizens that costs less money. Oh, regarding the dreaded subject of taxes – isn’t paying some efficient amount for our common defense against sickness and hazards better than a taxing private debilitating legalized levy? Substantive health care reform will also help business, except health insurance companies, in being more competitive on the world stage. A robust public plan would assist that engine of growth, small business, and unleash many to consider possible entrepreneurial options. It would be a bulwark of support for conservative ideals in trade and individual initiative. Let’s hope Mr. Smith takes his next column to the logical conclusion by researching the Italian system and recommending the model based on its conservative and prudent investment of funds that generate excellent outcomes. Reforming health care with a public plan ought to be a conservative ambition. Major rally for single-payer health care and to protest Anthem's suing the taxpayers of Maine at the Kennebec County Court House at 95 State Street in Augusta, Maine (map) on Wednesday, 7 October at 12:00 noon. We are very fortunate to have Wendell Potter, the former health care insurance executive turned reformer speaking at this event! Brave New Films is supposed to also be there and I suspect filming for additional footage of their coverage of the WellPoint affiliate Anthem Blue Cross and Blue Shield's suit to guarantee profits in Maine. An editorial in today's New York Times is a strong and moral call to dismiss right wing delaying tactics and encouragement for the majority Democrats to forge ahead to enact health care reform now and an opinion column in today's Washington Post provides good instructions for how to support the effort and why action is vital. Washington is increasingly turning to Senator Olympia Snowe in the battle for health care reform to be a key deciding vote. That light shines on us. Our petitions for her representation as her constituents can make a powerful difference. Please contact Senator Snowe multiple times, in multiple ways, and by multiplying yourself by asking everyone you know to do likewise. Expect a sincere effort to memorialize Senator Edward Kennedy by naming an eventual health care act after him. It would be exceedingly appropriate unless the bill is not substantive reform. In that case it would become a heartbreaking false tribute. Senator Kennedy believed fully in the power of government to do good. A bill devoid of a robust public option would not honor the history of his effort to advance health care reform. Senator Kennedy cared deeply about those without voice and means. An act not extending a generous and caring hand to the poor and disenfranchised could not in good conscious carry his name. Senator Kennedy believed that affordable health care for people with average resources was essential. Legislation that allows medical impoverishment and bankruptcy to persist would not respect his memory. Senator Kennedy believed that health care needed to be portable. A bill not allowing Americans to carry their coverage with them or seamlessly switch to a public plan could not be a tribute to his effort to prevent health care insecurity. Senator Kennedy believed that health care practices needed reform. Legislation that merely mandates coverage along with minor tax incentives that does not address practices, care quality, better outcomes, and payment restructuring would not reflect his vision. Ted Kennedy’s moral commitment to health care as a right and not a privilege was exemplary; anything less at this time cannot yet be his legacy. Senator Mike Enzi, part of the "gang of six" that includes Olympia Snowe is assuring conservatives that his participation in reform negotiations is delaying health care reform. "If I hadn't been involved in this process as long as I have and to the depth as I have, you would already have national health care," he said. Thanks a lot; so much for working for the common good and in good faith. We call upon Senator Olympia Snowe to publicly reject and disavow Senator Enzi's remarks. We urge her to go far beyond the typical characterization of "unfortunate remarks", et cetera and establish a renewed commitment to consensus negotiation that considers citizen needs first and does not dismiss a robust pubic option out of hand. Watching the Right’s appalling destruction of debate on health care reform can sometimes obfuscate their true goal: no change; exactly the opposite of what citizens voted for in the most recent election. Even the ideas trotted out by conservatives or temporarily conceded to generally serve the straw purpose of setting up a reasonable sounding alternative to the dire consequences of the existing most progressive offering that once defeated moves the debate to the straw reasonable alternative so it can then be undermined by another even lesser value but reasonable sounding alternative to be destroyed by…and so on and on and on. (Sorry, a run on sentence was absolutely required for this illustration!) The initial colorful rainbow of change gets gradually murky gray and dumps into a pot of no change mud. Behind door number one is Single Payer which is vilified and rejected allowing the Public Option to step up behind door number two. Now the Public Option is getting the plug pulled and the next reasonable sounding option behind door number three is Co-ops. Now the wave of argument against Co-ops is starting to rise as noted in an opinion piece in the Wall Street Journal. The replacement next good sounding idea will likely be Market Exchanges that could deliver success for the right in producing no change. Moderates, sometimes knowingly and sometimes not, are being used by the no change right as their temporary front line action in a rear guard battle they strive to win for their unfettered markets forever constituency. Citizens and their health care are merely obstacles. We must draw a clear battle line at the Public Option.